The term Santa Claus comes from the Dutch ‘Sinterklaas’ meaning ‘Saint Nicholas’ and was first used in American English around 1765. Santa Claus is a fictional character who delivers presents to well-behaved children on Christmas Eve. The legend of Santa Claus has its origins in Western Christian culture, and is largely based on the historic figure of Saint Nicholas, a real-life Greek bishop who lived during the 4th century and was known for secretly leaving gifts at the homes of children. 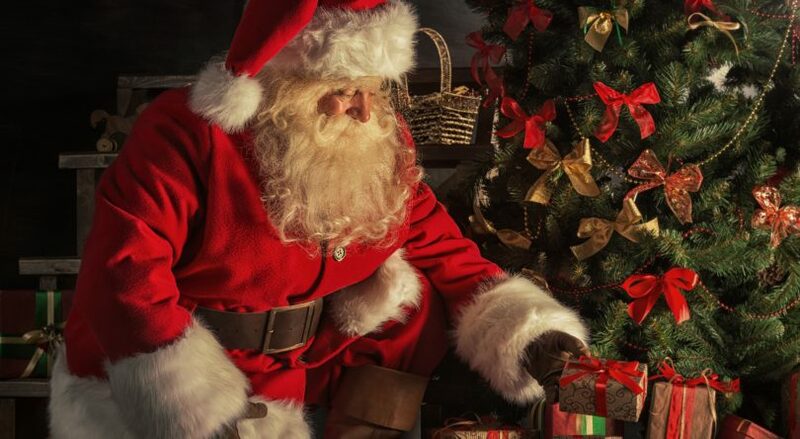 According to folklore, Santa Claus lives at the North Pole, where he keeps a list of the names of all the children in the world, marking them as ‘naughty’ or ‘nice’ depending on their behaviour throughout the year. He brings presents to the homes of good children on Christmas Eve with the help of his elves and the magic flying reindeer who pull his sleigh.